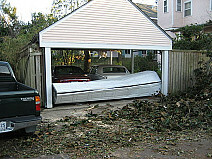 Will Your Insurance Cover Garage Door Repair? Crash! Crunch! There are few things less like music to a homeowner's ears than the sound of a vehicle (your own or someone else's) backing solidly into your garage door. And the sight of willful damage to the garage door, whether by an arsonist, burglar, or common-or-garden vandal, is equally upsetting. Obviously, you need to get the door fixed as soon as possible but how are you supposed to pay for it? Should you ask your insurance provider to cover the repair? The answer is not clear-cut, but depends on a number of factors. If you accidentally drive your car into the garage door on a property you own, the issuer of your homeowners insurance policy is responsible. On the other hand, if you are driving and damage someone else's garage, other buildings, or belongings, look to your automobile liability policy for coverage. If your own car is also damaged in the melee, your collision insurance will protect you. And if a neighbor or a stranger rams into your garage door, repair costs will be shouldered by their liability policy. It's not only human frailty that can mess up your garage door. There are also all kinds of disasters. The most commonly experienced is extreme weather -- severe hail, lightning, snow, or windstorm. Fire is another major culprit, which can wreak havoc within minutes. Usually, resultant damage will be paid for by your homeowners' insurer. However, this does not hold true in 100 percent of cases. Read your policy through carefully to see exactly what types of damage are covered and which are exempt. In some cases, your HOA may be responsible to fix weather-related wear and tear to your garage door. Again, look at the fine print on your agreement to see where the responsibility lies. If you notice any sign of tampering with your garage door, report it to the police immediately. A criminal may have been interrupted in the course of attempting to break into your garage, your vehicle, or your home. Needless to say, you should contact the police regarding all acts of vandalism, arson, or actual or attempted robbery, especially if you suspect that the perpetrator may still be on the premises. Then call your insurance company's emergency number and ask for their instructions; they may require you to hire a garage door repair service only from their approved list. After the police have checked the scene, ask for a copy of their report and hold on to it -- you will most likely need to submit it as backup for your insurance claim. Have the door taken care of ASAP, so that your garage and your home are not vulnerable to further criminal attacks. Make sure that the access door leading from the garage into the house is securely locked at all times. Once you have the repair estimate, you will need to make two quick decisions. First, is it worth making an insurance claim? This depends on the size of your deductible. If your deductible is $500, for example, and the repair cost comes to $520, you may not wish to go to the trouble of claiming the extra $20, especially because this might lead to an increase in your insurance premiums.